SMB cloud computing advantages are changing the landscape of the entire IT channel, and resellers and VARs must act quickly to ensure they are not left in a cold cloud of dust. Just consider some of the nuggets in this great infographic via Technology News Hub. At least half of the respondents cited in an earlier Bain report how improvements in security, data access, ROI, customer satisfaction, productivity – sounds like all of the buzzwords we have been using for traditional IT over the past 3 decades….could it be even that much better? The largest obstacle to increased cloud computing adoption (aside from, paradoxically, security – which appeared as both a benefit and an obstacle) seems to be that of awareness and education. Channel resellers and VARs have a marvelous opportunity to be the key advisors SMBs need in circumnavigating cloud computing advantages. With all of the discussion within IT circles about cloud, still, 71% hadn’t heard of nor knew anything about the subject. 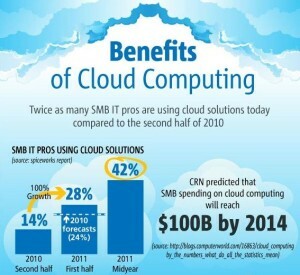 This says that the numbers relative to the benefits of cloud computing are derived from 29% of those polled. Here is a talking point to kick off your cloud customer discussions, and education.